(Wild Apple (Malus spp.) 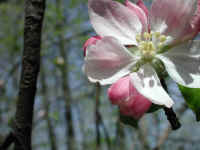 - 05) Every spring the blossoms of the wild apple trees add a sense of wonder to the woods. This sense of wonder is accented by their perfume and the buzzing of the visiting bees. 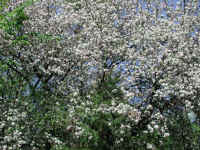 This spring, 2001, the blossoms were exceptional, as can be seen in this photo. (Wild Apple (Malus spp.) - 01) There is natural beauty in the contrast that these scattered apple trees bring to the woods that is often lost in the orchards with their rows of similar trees. (Wild Apple (Malus spp.) - 02) Every spring we wonder: "Was this beauty of the wild apple trees brought to us by the helping hand of a 'Johnny Appleseed', or by a deer or squirrel that was enjoying the apples in the late summer and fall?" We will never know. We are just thankful that they are there for the enriching of our soul and spirit. (Wild Apple (Malus spp.) 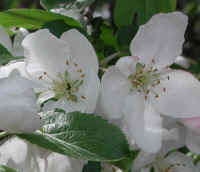 - 03) The clusters of apple blossoms may look alike at a distance, but close up they are unique, presenting a special beauty all their own. (Wild Apple (Malus spp.) - 04) The people who feel that they must improve on nature by cutting everything down and replacing what was there with formal gardens and lawn are missing much of the beauty that God has given us. There is a place for both in the same areas. 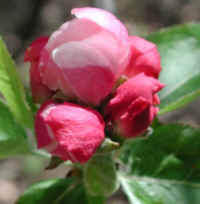 This wild apple and cedar are in our front yard, and adds to the beauty of our property. Let us resolve to preserve the wild and natural beauty in the midst of our human "development". (Wild Apple (Malus spp.) 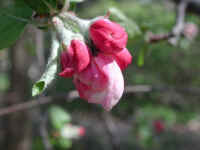 - 06) During the first week of April, the wild apple flower buds usually begin to enlarge, and will soon open. (Wild Apple (Malus spp.) - 07) This photo shows that both the leaves and flower buds develop at the same time: the leaves are just beginning to open and the bud are red and swollen. (Wild Apple (Malus spp.) 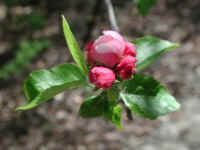 - 07a) In this close up photo we can see an apple leaf and a bud before they have opened. (Wild Apple (Malus spp.) 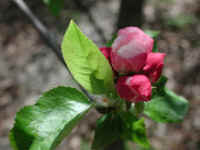 - 08) The wild apple flowers have fully opened, as have the leaves, but the leaves will continue to enlarge a little more. (Wild Apple (Malus spp.) 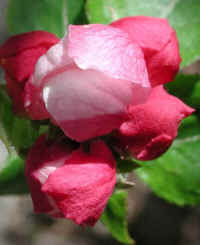 - 08a) Every wild apple flower has light pink 5 petals, having lost most of the bright red color of the buds, and numerous stamens. The leaves are lightly toothed on the edges or margins. (Wild Apple (Malus spp.) 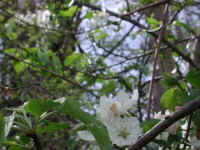 - 08b) This is another close up look at two of the wild apple flowers and a leaf. 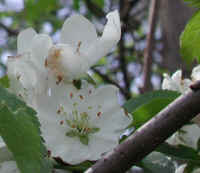 Each flower also appears to have five pistils, matching the number of petals, but the number of stamens seems to vary. (Wild Apple (Malus spp.) 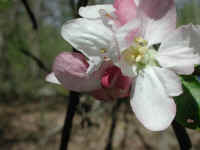 - 09) This is another look at the beauty of the wild apple spring flowers. (Wild Apple (Malus spp.) 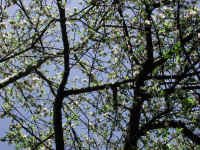 - 09a) In this photo, we can also see the color and texture of the bark on the smaller branches of the wild apple tree. (Wild Apple (Malus spp.) 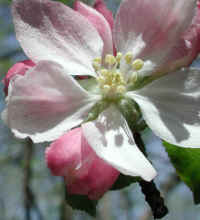 - 10) The splendor of even a single wild apple blossom brightens the whole woods around it. (Wild Apple (Malus spp.) 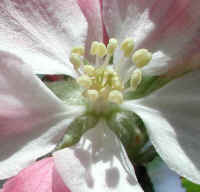 - 10a) This is a closer look at a wild apple tree flower. (Wild Apple (Malus spp.) - 10b) In this bee's eye view of the center of a wild apple tree flower, we can clearly see the circle of pollen coated stamens around the central cluster of pistils. (Wild Apple (Malus spp.) - 11) This wild apple tree flower was damaged by something, most likely before it opened, because of the appearance of the twisted and still vertical petal. (Wild Apple (Malus spp.) 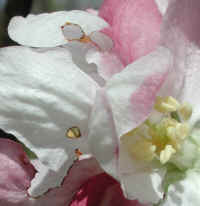 - 11a) This is a closer look at some of the damaged petals on the wild apple tree flower. (Wild Apple (Malus spp.) 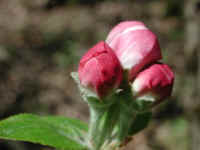 - 12) This is a wild apple tree flower bud that is just beginning to open. (Wild Apple (Malus spp.) 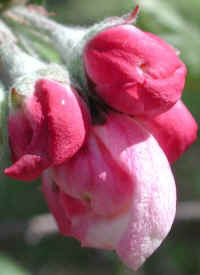 - 12a) This is a bee's eye view of a wild apple tree flower bud that is just beginning to open. (Wild Apple (Malus spp.) 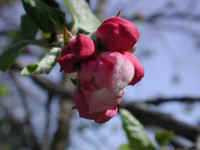 - 13) This is a cluster of wild apple tree flower buds. (Wild Apple (Malus spp.) - 14) While looking at these wild apple tree flower buds, we can also see the underside of one of the leaves, and compare the texture with the top of the leaf below. (Wild Apple (Malus spp.) 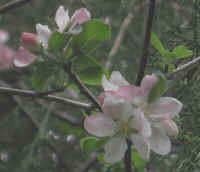 - 15) This is another look at a cluster of wild apple tree flower buds. (Wild Apple (Malus spp.) 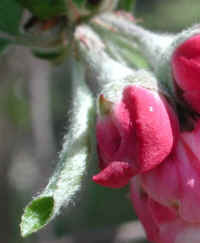 - 15a) This is a close up look at a cluster of wild apple tree flower buds. (Wild Apple (Malus spp.) 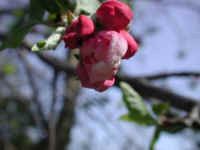 - 16) As we look at this cluster of wild apple tree flower buds, we can see that the adjacent leaf has not yet opened. (Wild Apple (Malus spp.) 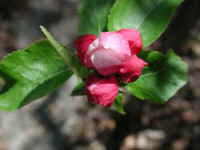 - 16a) In this photo, we have a closer look at the unfurled wild apple tree leaf, and a flower bud. (Wild Apple (Malus spp.) 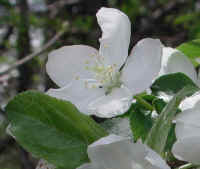 - 16b) This is another close up look at a cluster of wild apple tree flower buds. As we look upon the beauty of these buds and the flowers to come, we see them as a gift from God to give us some joy in the midst of the turmoil of the world around us, and the hope of a better tomorrow. (Wild Apple (Malus spp.) 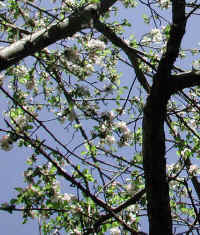 - 17) In this photo, we are looking up through the branches of a blooming wild apple tree. (Wild Apple (Malus spp.) 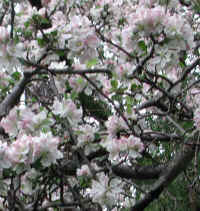 - 17a) We have been enjoying the beauty of this wild apple tree, which grows in our front yard, for the past 34 years. (Wild Apple (Malus spp.) 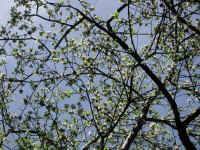 - 18) This is another look up through the branches of a blooming wild apple tree. (Wild Apple (Malus spp.) 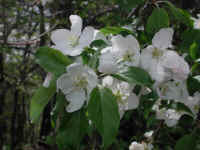 - 18a) In this photo of a blooming wild apple tree, we can also see the color and speckled texture of the bark.